If you’ve had a heart attack or have been diagnosed with some form of heart disease, participating in a program that combines lifestyle changes and proper physical activity will improve your rate of survival. 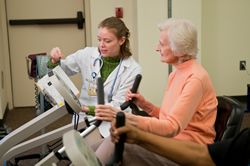 The Cardiac Rehabilitation Program, part of Cardiovascular Disease Prevention and Rehabilitation at the University of Michigan, has the team of experts, the comprehensive array of services, and a cutting-edge fitness center to help you improve your cardiovascular health and return to your normal life. In addition, participating in cardiac rehabilitation greatly improves your quality of life. You’ll be relieved of chest pain, fatigue and shortness of breath. You may feel less psychological distress, and many patients will see a reduction in weight, blood pressure, and cholesterol. Additionally, you’ll be more fit and in better compliance with medical treatments. Quite often, in the weeks following a smaller heart attack or angioplasty, some people feel well enough that the idea of going through a prescribed cardiac rehabilitation program seems unnecessary. They decide that exercising on their own is enough. The fact is, however, that most people don’t do it on their own, even though they mean to. And they don’t know how much exercise to do. They can do too little and not get enough benefit, or do too much and cause themselves further harm. In fact, exercise is only half of what we do. We also provide education – from appropriate nutrition to stress management – return to work evaluations, recommendations to your doctor, heart monitoring, medication monitoring, and much more. In some cases your insurance may cover congestive heart failure as well. Cardiac rehab can also be used as an alternative to angioplasty and coronary bypass surgery for relief of angina. For patients with angina or chest pain not controlled with medication, angioplasty or bypass surgery, we offer enhanced external counterpulsation or EECP® therapy. This non-invasive treatment increases blood flow to the heart, and when combined with cardiac rehab, can markedly improve quality of life for patients with heart pain. When we receive your referral, the first thing we do is call you to make sure our program is the most local for you. If you live too far away, we provide you with the hospitals in your area with cardiac rehabilitation programs and we call that program to provide them with your referral. We do this because it’s most important to us to ensure patients are entering and completing cardiac rehabilitation, even if it’s not with us. To enter our Cardiac Rehabilitation Program, you first meet with our nurse practitioner, who conducts a thorough evaluation to ensure you are able to participate in cardiac rehabilitation. You then undergo a blood test plus a stress test with an EKG to measure your fitness level. Once all that information has been collected, our team of certified exercise physiologists prescribes an exercise program individualized for your needs. During the 6- to 12-week program, you will be taught how to use the equipment at the Preventive Cardiology Fitness Center, and which equipment is right for your age and health issues. You will be guided through weight training and stretching. You will also learn everything you need to continue your lifestyle changes once the program ends, including exercising at home. You need a physician referral with a qualifying diagnosis to be eligible for this program. Call 734-998-9590 for more information.